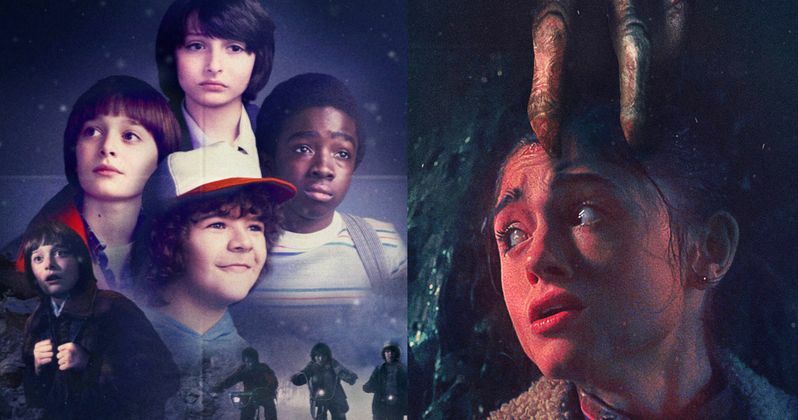 Netflix has released a new set of posters for their hit series Stranger Things and they pay homage to Wes Craven's A Nightmare on Elm Street and Rob Reiner's Stand by Me. It makes perfect sense for these tribute posters to be released as the hit show draws heavily from both of the classic 80s movies in a way that still feels unique and fresh. In addition, the score, which was written on synthesizer, is also a throwback of sorts and is more than a little reminiscent of the soundtrack work of John Carpenter. The posters, from Stranger Things Twitter, are promoting Stranger Things Season 2 and the newest poster to be shared is the Nightmare on Elm Street mashup that takes full advantage of sharing the main character name of Nancy. The Stranger Things caption on the poster reads: "If Nancy Doesn't Kill The Demogorgon, It's Coming For You Next," which is a play on the original Elm Street poster. They even get the fonts to look pretty similar along with a Demogorgon hand reaching out for Nancy's head instead of Freddy Krueger's iconic glove. It does a perfect job matching the vibe of the original poster. Next up is the Stand by Me mashup that is almost too perfect. Not only is the poster perfect because Stand by Me is one of the biggest influence on the Duffer Brothers' Stranger Things, but also because it looks spot on. The Duffer Brothers used the script for the Rob Reiner movie when casting the roles of the show without having their own material really fleshed out. As another tribute, the 4th episode of the first season is called The Body, which is a nod to the name of the Stephen King novel that the movie is based off of. Stranger Things ends the first season in a very similar way to how A Nightmare on Elm Street ends when Jonathon and Nancy lure the Demogorgon into the house with booby-traps and then set the house on fire. Sound familiar? The Demogorgon is even able to stretch the wall just like Freddy Krueger in episode 2 of the first season, which is titled The Weirdo on Maple Street. Nancy's name even comes from the legendary horror movie. Stand by Me references on the other hand, are less subtle in the show. The young actors in Stranger Things even look similar to their counterparts in Stand by Me and some of the shots are very similar and the story even parallels each other. There's bullies and switchblades, journeys on train tracks, and searching for someone or thing that is missing. Stranger Things Season 2 is set to premiere exclusively on Netflix on October 27th, 2017. The new Season takes place on Halloween of 1984, one year after the events of the first season and the Duffer Brothers along with the cast have promised an even scarier trip this time around, which is quite the claim. The wait is almost over, but in the meantime, check out the awesome Stranger Things Season 2 tribute posters below.